Today I’m on my own again as FIL and Benzo are back to working on the kitchen floor. I’ve mentioned the kitchen floor several times the past few weeks so I thought I would post some pictures of the current state of my kitchen. First let me say that we have been trying to get the kitchen done for forever. Like years. Seriously. Remember this post? That was well over 2 years ago! 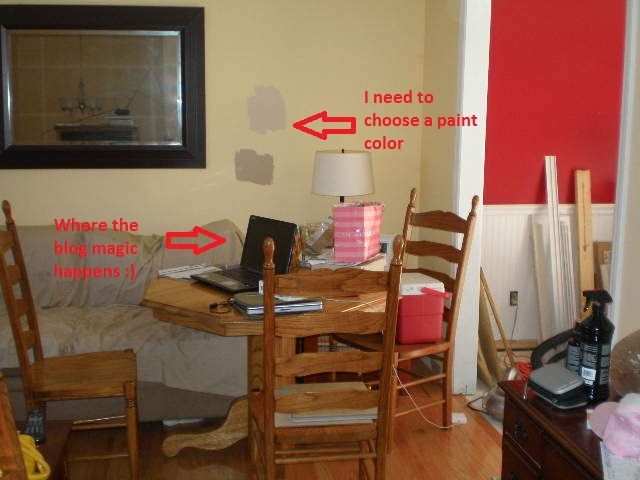 Needless to say I’m not the best at getting projects done in a reasonable amount of time. 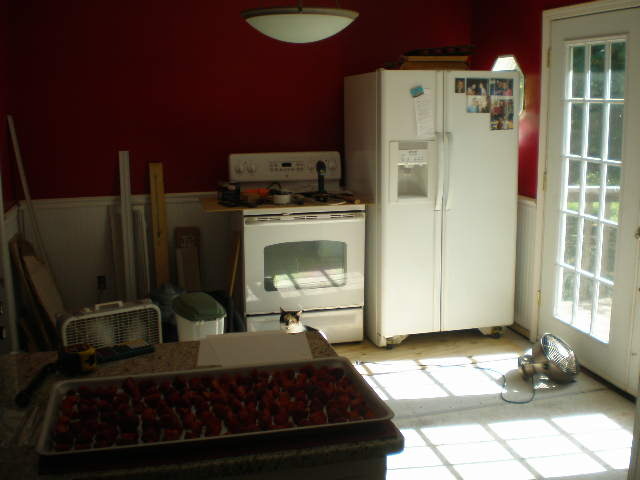 But the kitchen has been a huge undertaking. So after removing wallpaper, installing wainscotting, installing a new back door, painting the kitchen cabinets and walls and replacing all the trim, we had new counters and backsplash tile installed last December. After that was done it was finally time to re-do the very last element – the floor. After removing the old floor (hardwoods that were super worn out and too thin to refinish), we found there was a thick layer of particle board that also had to be removed. Then we found that the sub floor was not sound enough. So Benzo and FIL had to shore up the subfloor from underneath. Well that involved tearing out the ceiling in the basement and putting in all these boards and stuff under there. After the subfloor was secure they then installed cement board. Now finally the floor is ready for tile. 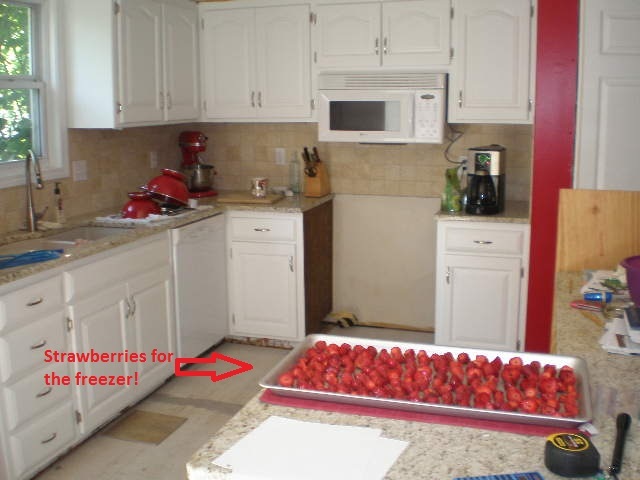 The stove and refrigerator had to be moved so they could install the cement board underneath. They will lay tile today on this side of the kitchen. Then Benzo will grout it after 24 hours. Once the grout is dry and sealed, they will move the stove and refrigerator back to their homes. 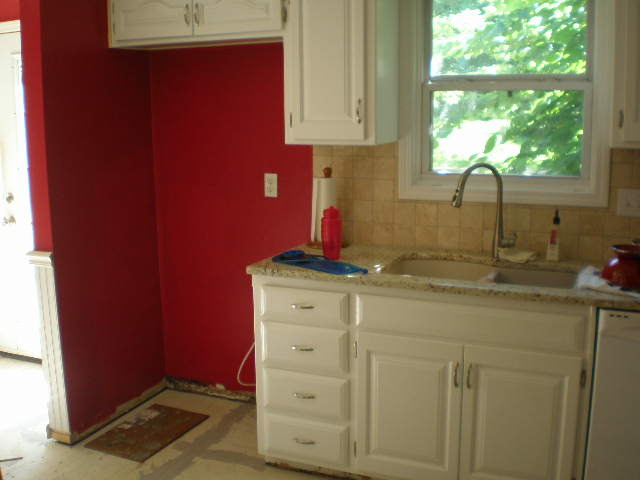 Then they’ll tile the dining room side of the kitchen. My stove and refrigerator have been on the other side of the kitchen for a week. The fridge is still plugged in but the stove isn’t because it requires that special plug. So I haven’t been able to use the stove at all. And the kitchen table has been in the living room for who knows how long. That’s where we’ve been eating our meals! The whole house is such a mess right now! I can’t wait until the kitchen is done so I can clean everything up! Once the floor is done then all we have to do is install and paint the baseboards and the rest of the trim. We also need a new light fixture for above the table. Finally I want to get a new kitchen table and shelves. I’m going to start watching Craigslist when we get back from vacation. I’d really like to buy something gently used if possible or maybe find someone who would trade their table for ours. There’s nothing wrong with our table, I just want a darker finish and a leaf so I can expand the table to seat 8 people. I’ll be sure to post before and after pictures when everything is complete. I can’t wait! * weirdo plug-in specialty items such as a hotdog cooker, sandwich griller, etc. I found it pretty easy to live without a stove for a while with just a big toaster oven and a hot plate. (Hot plates are quite cheap, by the way, and are basically single burners that you can set on a counter and plug in.) I wouldn’t have been able to host Thanksgiving dinner, though! It actually hasn’t been that bad not being able to use the oven. I thought I would notice it a lot more than I have. Since its warm we’ve been eating a lot of cold meals like salads and wraps. I do have a toaster oven that I’ve used a couple of times. I also have a hot plate but haven’t gotten it out yet. I probably will this week. And even though its warm I’ve used the crockpot too. For the hot dog cooker, are you talking about those toaster-like appliances that cook hot dogs and toast buns at the same time? Those things are so funny! Wow! That reminds me of my house! We are also working on the kitchen floor and painting the walls, but I’ve been doing much of it myself, which means it’ll be partially done until I have more time. Looks like they are really making progress and you have some great ideas of what you want! Can’t wait to see the finished project!